Biryani.. Aha !! Mouth-watering.. isn't it? My mouth waters every time I see pictures of biryani, cooked by self or someone else and I crave it immediately. 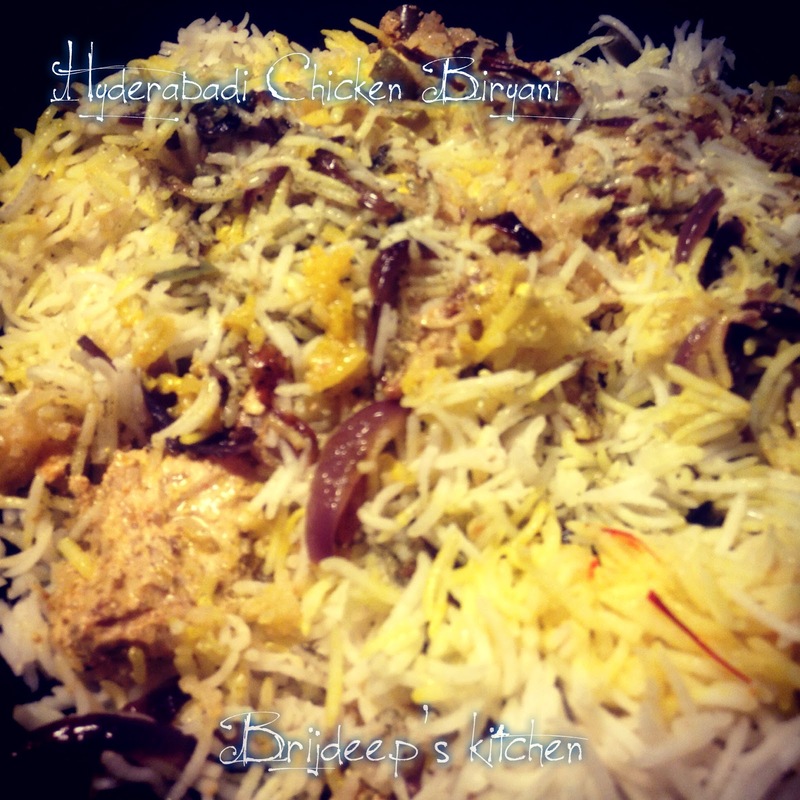 I had heard a lot about the famous "Hyderabadi Biryani", but never did I think I would make it in my kitchen.. It is time-consuming, and not very easy to make, as the ingredients must be perfect, otherwise it won't taste half as good, with all the effort wasted, sadly !! So, after thinking for weeks on and pondering over weather should I make it myself or just wait to get back to India to have it in a nice restaurant, finally I decided to give it a shot.. and whoa !! It turned out to be perfect, and though it has been more than a month I prepared it, my mouth still waters when I look at the pictures.. Oh! It was just perfect.. I could only capture how it looked, I wish I could capture how it tasted as well. Biryani was introduced when Mughal Emperor Aurangzeb conquered southern India. 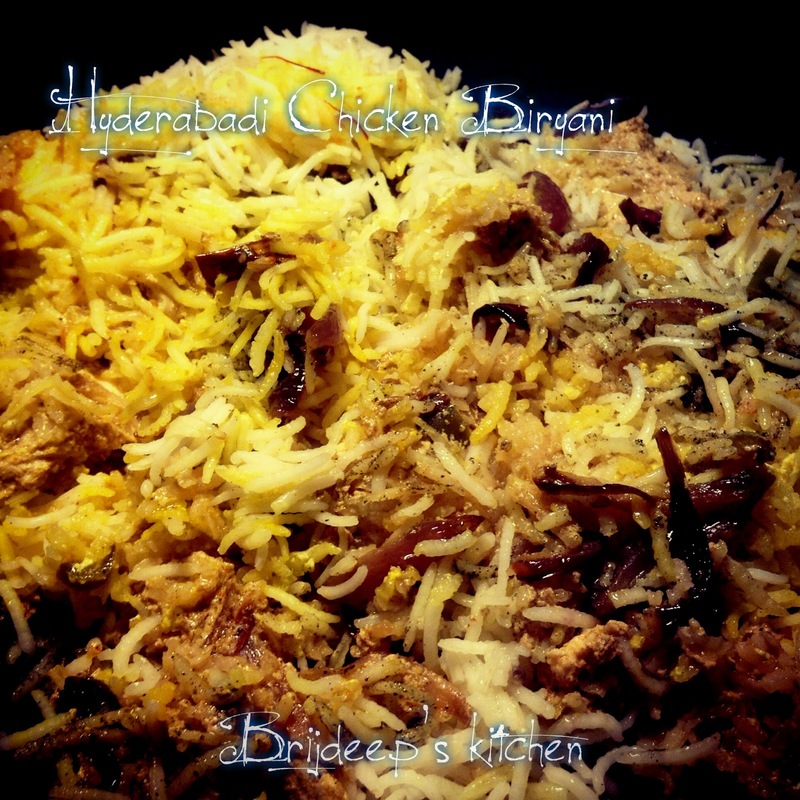 The blending of Mughlai and Telugu cuisines in the kitchens of the Nizam, rulers of the historic Hyderabad State, resulted in the creation of Hyderabadi Biryani. These perfect pictures of the biryani remind me of the amazing taste and I drool over and over!! Hyderabadi Biryani is made in two ways: Kacchi biryani and Pakki biryani. 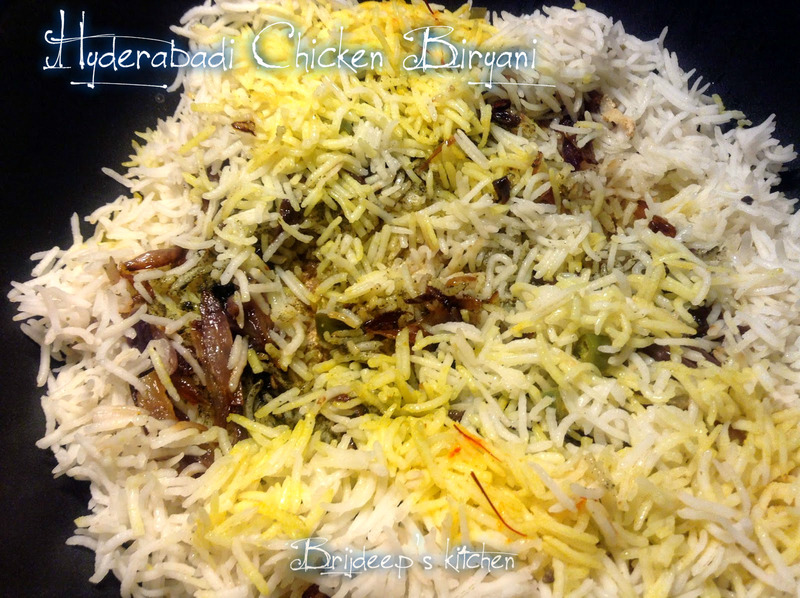 In Kacchi biryani, we marinate the chicken for a longer time and cook it in steam, layered with rice. This is more difficult version of the Hyderabadi Biryani. 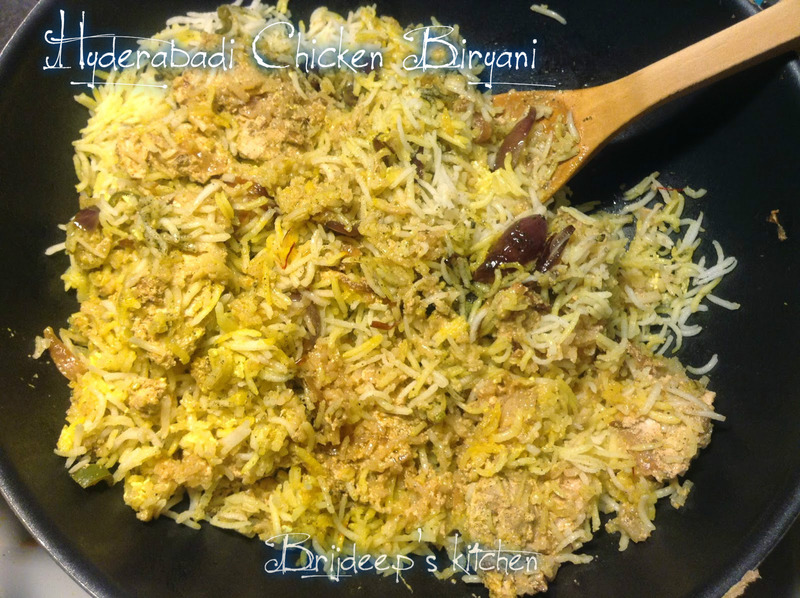 In Pakki biryani, we marinate the chicken for the shorter time, and is cooked before layering with the rice; which is the easier version. Mint leaves (or mint powder) a handful/ 2 tsp. Heat 2 tsp. oil in a pan and add 2 sliced onions. Fry them until brown. Remove from heat and keep aside. Mix yogurt, salt, red chili powder, ginger, garlic, Hyderabadi masala, cumin seeds, 2 tsp. lemon juice, 1 green chili (finely chopped) and half the mint leaves. Mix this with the fried onions. Marinate the chicken pieces in this mixture for about 4-6 hours. The longer the better. Wash and soak the rice for 1 hour in water. In a big pot, boil water with cloves, cardamom seeds (and covers), cinnamon, 2 tsp. lemon juice, 1 green chili, 2 tsp. salt and a few coriander leaves (optional). When the water starts to boil, add the soaked rice. Cook until the rice is boiled and done. Drain all the water and keep boiled rice aside. In a pan, fry the remaining 2 onions in a little oil (as done for the marinade). All the onions can be fried together also. Then use half for marinade and half for layering. Add 2 tsp. oil to the marinated chicken and mix well. Now, in a big pot (which can be covered tightly), add 1 tbsp. ghee and the bay leaf. This will keep the rice from sticking to the bottom. Now spread a very thin layer of boiled rice. Then add the marinated chicken with all its contents above the thin layer of rice. Now from the remaining rice, add half in the next layer and spread evenly. Then add fried onions and mint leaves (or mint powder) and spread evenly. Add the remaining boiled rice to the top layer and spread evenly. Mix food color in 2 tsp. water and sprinkle on the top. You could use turmeric powder also if you don't have the food color. Sprinkle the biryani masala and the saffron above it. Add the milk and ghee on the top layer. Now cover the container with the lid and tighten it with atta dough on all the sides. Keep it on lowest flame and let it cook for 60 minutes. Do not remove the lid in between to check. After 60 minutes, remove the lid, mix and serve hot with raita or achaar or Tamatar ka salan or Baby onion ka salan. Thanks for sharing!! will try it soon. Plz give me the receipes of pakki biryani style.